hey there again eberybody! Im in a bit of a pickle and have exhausted all me reading capabilities with flipping through the forums here and elsewhere so i figured i might dust off the ole' keyboard. I apologize in advance if this turns out to be a but lengthy. > I finally made it down the hill (and up a few and again down a few) to chirco in tucson to buy some parts. Where i am now is a bare rear end (hrm... too many conotations for that phrase) with just forks and a stock Type 1 transaxle from my super. I spent (way over my goal ) about 1407.92 greenbacks yesterday on a set of 3x3 arms, a "930 CV Stub Axle Kit" and "5 lug heavy duty rear disc brake kit ". Since its called a "kit" I was hoping everything i needed would be there, but I was told that my stock super stuff would need to be saved to snag a few "bushings, bearings etc". WEll heres my issue, I pulled apart the stock drums off the old stuff and also broke down the old cvs and axles, but found nothing but the same things I have from the " " kit, and no "bushings, bearings etc". So I pretty much need to know what I need to order. I know that the 3x3 arms need some kind of bushing or bearing because the receiving hole is WAY to big for the stub axles to fit right. also, I will need a set of bushings for the 3x3's to mount to the stock pivot bracket at the torsion housing, but which one? ..lets see what else.. oh yes, how the heck is one to remove the torsion bars within the housing? I pulled off the spring plates, but cant get the darn bars out.... The next issue Ive got to tackle is the caliper mounts that came with the kit. the problem Im having here is that the chirco build shows the mount bolting flush with the 3x3 arm. but mine wont do that because the arm is too large, ie the mount wont go on the end and over the edge of the arm, it will only go on backwords to line up. I really wanted to post pics of this all but I cant seem to get onto chirco's site for the past few hours. again I apologize for being so wordy, but thank you SOOOO much for your ongoing help with everything folks! I hope things will be cleared up up for you soon. please call Chirco at 1-800-955-9795. Don may not be on duty, but the other guys will help ya. if they dont let me know! pretty sure your stock bearings work with 3x3s, the spacers,and seals will work. just regular urethane pivot bushings. you will need a seals for the trans drive flanges. stock size. the caliper mounts you will have to cut or fab new ones. if youve taken the 4 bolts out for the spring plate cap, removed the springplate just pull and wiggle the torsion bar will come out. Don from Chirco told me you will have to weld the caliper brackets on if you have 3x3s with disc brakes. Other than that, you can use stock T-1 bearings and seals on the stubs, and urethane bushings on the pivots. One thing you will need to do is to make clearance for the 930 CVs. They are larger diameter and will hit on the frame horns. You have 2 options, clearance the frame horns, or raise the trans in the back 1 inch. I just take an aftermarket solid mount, and put the mounting hole for the fork bols down an inch. 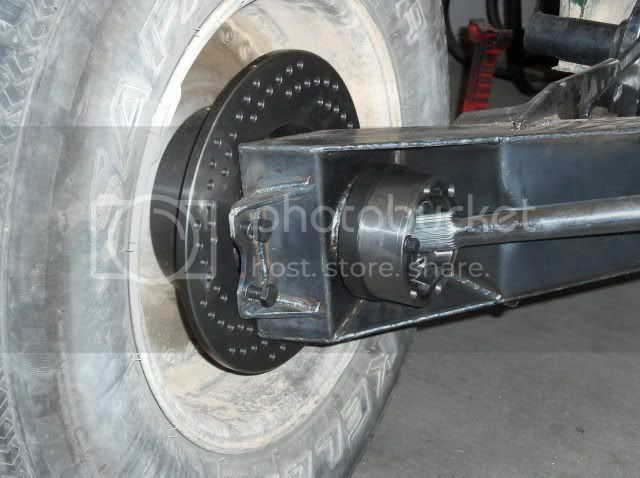 This will also give you more ground clearance on the motor. sweet, does anyone know how to remove the bearings and seals for the stub axles from the stock T1 and stock arms? One thing you will need to do is to make clearance for the 930 CVs. They are larger diameter and will hit on the frame horns. i dont have any clearance issues..
outer seal comes off with bearing cap. outer bearing usually not too tight just hammer and punch on outer race. inner bearing pull the seal prybar or screwdrivers. remove big snapring, hammer and punch again. a brass drift would be best, wont damage parts. Also, you spacers are inside there also. Make note of how they come out so you can put them in properly. The only hard or fabricating part is the caliper mount.